ExoClick’s in-stream video ad format works with all major HTML5 video players. Here we show you how to integrate the format using Fluid Player. Here is a simple piece of code that you can copy and paste into your site to test out Fluid Player. First log into your admin panel and follow the instructions in this FAQ. Once your In-stream zone has been created within your admin panel it is time to integrate the format into Fluid Player. Here is the code. Note you can select preRoll, midRoll and postRoll, in this code example we will use preRoll. You will also need to insert your idzone generated when you set up the ad zone in your admin panel, so in this code replace idzone=2366423 with your own idzone. There are additional advanced integrations that you can find here . 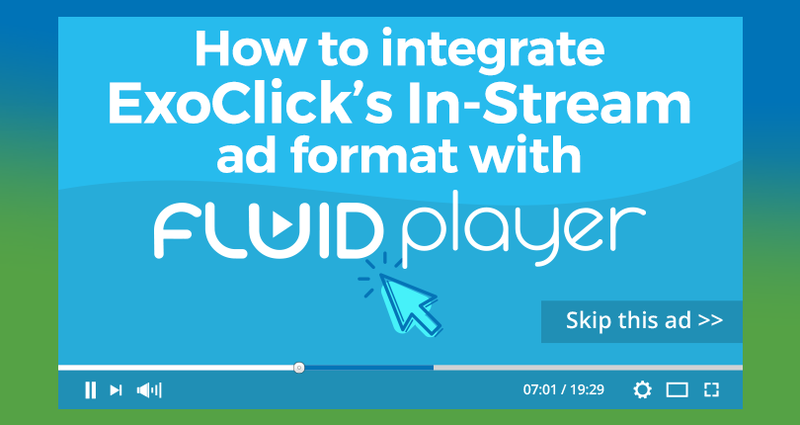 For a demo of some of the above ad formats click the play button on Fluid Player here.